The Italian parliament has blocked prosecutors from pursuing an investigation into Deputy Prime Minister Matteo Salvini for abuse of power and kidnapping migrants. 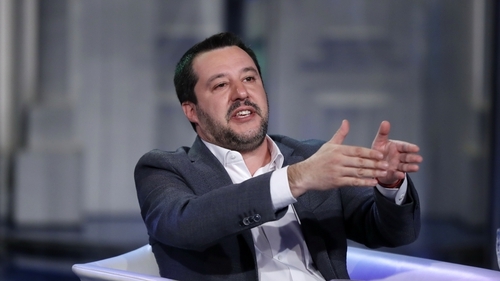 Mr Salvini, who is interior minister and leader of the right-wing League party, has declared Italy's ports closed to illegal migrants and asylum seekers since he formed a ruling coalition last year with the anti-establishment 5-Star Movement. In August, he blocked an Italian coastguard ship with 150 migrants aboard for almost a week off the coast of Sicily before finally letting it dock after Albania, Ireland and Italy's Catholic Church agreed to house them. Magistrates subsequently put him under investigation and asked parliament to strip him of his immunity from prosecution, but the Senate - the upper house of the Italian parliament - has thrown out the request saying he had been acting in the national interest. "I hope no one in this chamber ... has any difficulty in understanding the concept of nation and national sovereignty," Salvini told lawmakers ahead of the vote. "This is why Italians pay my salary: to defend our borders and to maintain the security of our country." With voting still under way, Senator Maurizio Gasparri, who heads the panel charged with considering Salvini's case, said it was already clear that a large majority had voted in his favour. The issue has sown division within the government and particularly within the 5-Star Movement, which has in the past criticised parliamentary manoeuvring to halt judicial proceedings against lawmakers. 5-Star Movement leader Luigi Di Maio held an online ballot last month among members, who voted 59-41 percent to protect Salvini. However, two 5-Star senators said they would ignore that ballot and vote against their coalition ally. These are expected to be expelled from the movement, which would reduce the government's already slim Senate majority. An Italian-led push to disrupt smuggling networks and boost Libyan coastguard interceptions helped to reduce the number of migrants who successfully crossed the Mediterranean Sea from Africa to Italy by around 80% last year, to about 23,000, according to the International Organization for Migration. Some 1,300 died in the attempt. In the latest of a series of stand-offs involving charity rescue ships, an Italian vessel carrying 49 African migrants was escorted into the port of Lampedusa by police yesterday, with Mr Salvini calling for the crew to be arrested. Prosecutors have ordered the ship to be seized and opened an investigation into the captain on suspicion of aiding and abetting human trafficking.